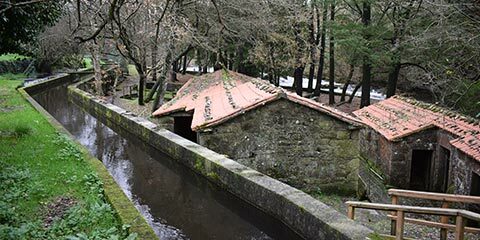 Set amid great natural beauty, on the banks of the Rio Grande, you will find one of the most extraordinary examples of a traditional Galician industry and a quiet recreational area to spend the day. The last fulling mills that were operational in Galicia, and where people from all over the Costa da Morte came to tamp their woolen blankets. 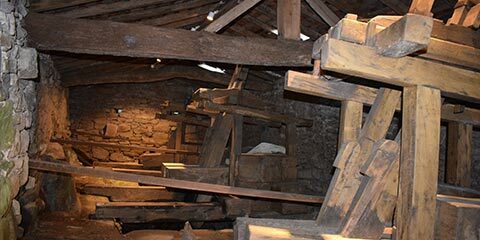 A unique set of hydraulic mills, with perfectly preserved machinery, in which both corn and wheat were milled. Welcome to the mills and fulleries of Mosquetín, one of the most extraordinary and unique ethnographic ensembles in Galicia. 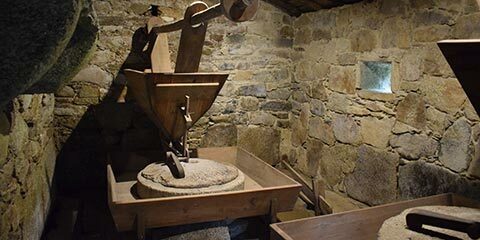 Here on the the banks of the Rio Grande, in a setting of great natural beauty, you can visit one of the last Galician fullery mills and 7 flour mills, each taking advantage of the same currents to move their machinery. The Mosquetin visit will allow you to learn the unique first-hand testimony of a time and a way of life that has disappeared, one in which our grandparents lived and worked. You will learn what the fulleries were used for, how their ingenious machinery worked, how they were in turn complemented by the mills, how they got their river water and many other exciting facts and stories. On this website you will find all the information you need to get a closer look at Mosquetín and make your visit an unforgettable experience.